Bondwell was the trading name of Bondwell Holdings Limited of Hong Kong and was the company that rescued the failed SpectraVideo, which had made its name (as SpectraVision) as a producer of games and joysticks for machines like the VIC-20 and Atari's 2600 Video Computer System before it launched its own almost-MSX machine the SV-318. SpectraVideo had been restructured having written off $2.6 million of past debt and was now being run by a new management team recruited from Atari and NEC. 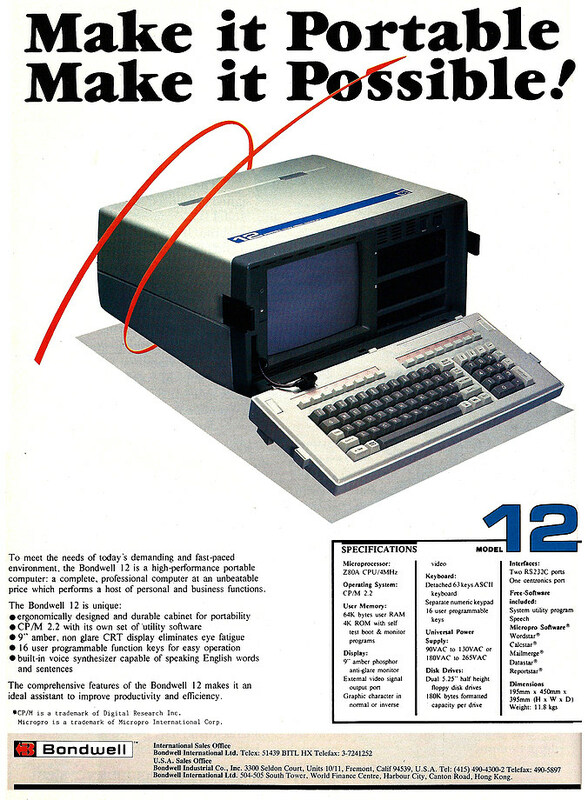 The Bondwell 12 was a Z80-based CP/M machine and was one of three "luggables" released at the same time, the others being the models 14 and 16. There was also a proper "lap top" - weighing only 11 pounds - in the shape of the Bondwell 2, as well as a pair of IBM compatibles. President of the new company, John Constantine, explained that marketing of the new company would be "largely locally-based because our present dealer network is widely scattered throughout the country". However, the company's work was cut out for it, as no Hong Kong manufacturer had yet been successful in the US market. David Ahl of Personal Computer World wondered whether SpectraVideo might be the exception before concluding "not a chance".